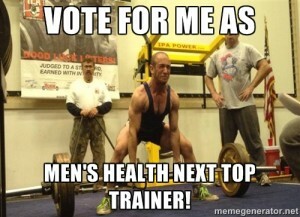 As you may or may not know, I’m in the running to become Men’s Health Next Top Trainer! Sitting at roughly 500 votes, I need your help to win this competition. Voting takes less than 30-sec and you can do it right here —> Cast Your Vote! The first phase of this competition lasts through April 3rd and you can vote every day so if you cast your daily vote I would appreciate it more than I could possibly express. In other news, I hope you’re ready for a hefty load of fitness information because this installment of The Week In Review is packed with some truly fantastic reads. Enjoy and have a spectacular weekend! Body Transformation Scams Exposed: The Fitness Industry is Fooling You! Monday’s Strength Lesson: Is your lack of mobility inhibiting your squat performance? Try going joint-by-joint to assess your movement and correct any issues. More info and video’s to improve your mobility for a stronger squat? Read THIS ARTICLE. Tuesday’s Strength Lesson: The Single-Leg RDL (SL RDL) is a fantastic drill that can be extremely difficult to learn. Use the simple cue below to drastically reduce the learning curve and immediately improve overall performance of the movement. When learning the SL RDL, it’s common for trainee’s to bend over with their torso rather than hinging at their hips. While this may not appear to make a difference, it’s a very important distinction in movement pattern, muscle recruitment, as well as safety of the drill. In doing so, the trainee will reach with the back leg (ideally while maintaining a neutral spine) which facilitates the hip-hinge pattern rather than bending over at the torso. Give it a shot (on yourself or your clients) and let me know how it works. Wednesday’s Strength Lesson: Get your sweat bands and short-shorts ready cause it’s Sample Workout Wednesday! Today’s workout is for those among us who are need of a de-load but would like something new, fresh, and fun. This week is a de-load week for me so you can join me and give this full-body session a shot. Thursday’s Strength Lesson: There isn’t just one “correct” technique for any lift. – Some people have a short torso and long arms (like me). – Some people have short femurs and a long torso. – Some people don’t care about lifting as much weight as possible…they lift to feel and move better! No two people are the same and, among other things, technique must be altered based on the individuals needs, goals, and preferences. If something isn’t working…quit trying to fit a square peg in a round hole and change it until you find something that works.